An 09:30 appointment in the centre of Bath, a 24 minute drive time, yet a need to walk out my front door at 07:54 if I'm going by bus, or 08:35 if I'm driving. Why? 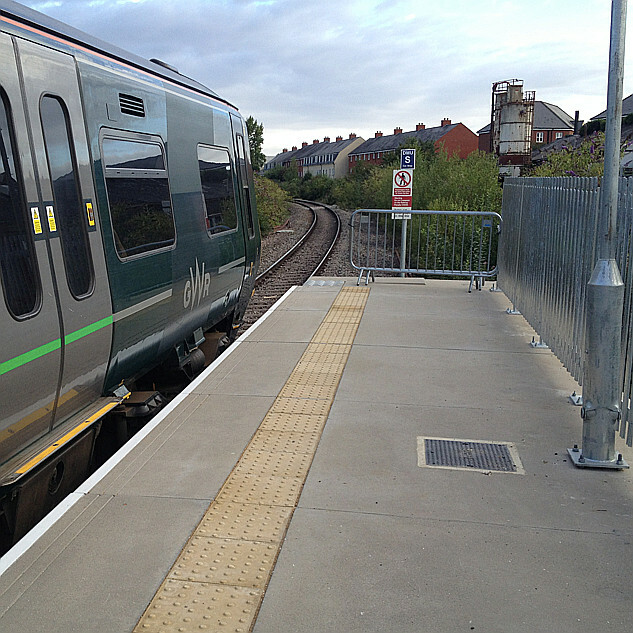 - note gaps of up to 2 hours in evening and Sunday buses home. When driving by car, just as on the bus, I find traffic congestion really frustrating. Traffic / road control time includes things like traffic lights, which delay too, yet somehow feel less frustrating if the light sequence is not painful slow. A bus lane on this particular route reduces the bus congestion time and frustration ... and increases driver frustration in the oft-jammed car lane alongside. A bus-only section of road also means that the bus can go through a way that cars cannot. So - how do we make for shortening bus end-to-end journey times, with a gain for passengers and for bus operator vehicle efficiency?? But, Grahame, you haven't included defensive scheduling, you know, when the bus doesn't show up and if the bus you planned to take is the first of the day do you travel the day before and book a night in a budget hotel ? In cases like you describe the car wins every time. An example, between Newquay and Truro there are 4 buses an hour, all by different routes. The 91 and 85 leave within 5 mins of each other from Newquay yet the majority of passengers go for the 91 for speed. Interestingly the retired generation often go for the longer routes. All carry reasonable passenger numbers, the 91 is effectively the fast express route with limited intermediate villages served. 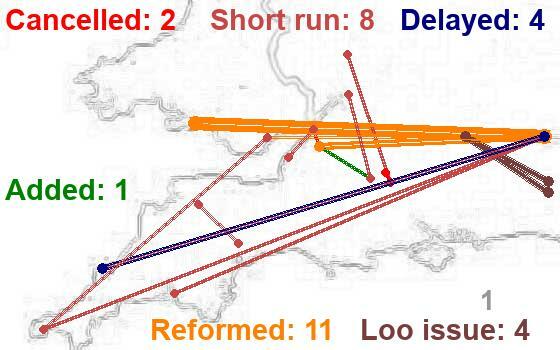 The other 3 routes pick up their loads at intermediate villages and housing estates, but carry less end to end passengers. In your route, would an express route and a slow route serving all the villages and housing estates. Route 1 serving end to end and the larger settlements in between. Route 2 servicing all villages and housing estates? Route 1 being a fast option would probably attract new passengers end to end as a viable alternative to the car, building passenger numbers if advertised well and a fair fare. The 91 and 85 leave within 5 mins of each other from Newquay yet the majority of passengers go for the 91 for speed. I considered that ... and if the 09:30 was an appointment which was time-dependent, I would suggest the bus 30 minutes earlier. But then driving I would also leave 30 minutes earlier. And a further 30 minutes for either mode for a critical appointment. Car is not immune from problems - I drove to the RUH (Royal United Hospital) in Bath about 10 days ago; on 9 out of 10 occasions I would take the bus but this one was different. Dropped off [name] near the door, then took 45 minutes to get parked up and back in - when I should have been offering support during [whatever], I was playing "hunt the space" with many others, the driving elsewhere / off site to park and walk back. Grahame, your very lucky if it only takes 7 minutes to find a car park space, pay and start walking to your destination. When I try to park I often end up driving around for half an hour (depending on time of day, of course). 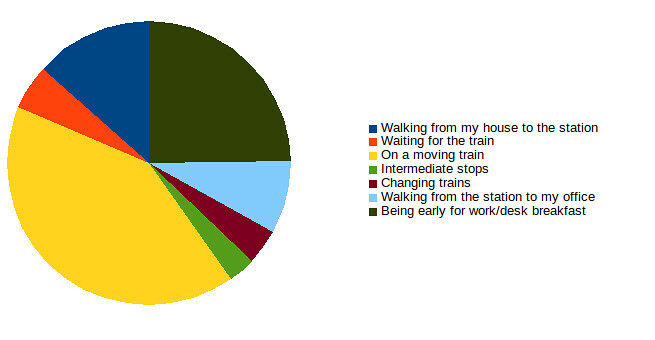 Since I've had my bus pass, I have used the bus into town (city centre) more often than not as its MUCH quicker. Do not make the mistake of taking the no. 46 bus to Paddington from King's Cross (56 minutes) - wait for the 205 (26 minutes)! I think my other follow up talking about 45 minutes to get parked was written in parallel with your writing - I am very much aware of the problems. For Bath City Centre, early appointment at [place], short term car park before all the short term visitors for the day fill it, car park that's pay before you leave (so the extra pay time is there) - yes - I have a lucky example. I understand the question / thought. I think for my specific example the compromise chosen is about right - I estimated (just) 8 minutes for the two sections of village / housing that could be bypassed. Without those sectors, and moving a half hourly service to two less frequent services, I'm unsure of the commercial viability. In fact I'm tempted another way if asked to suggest ... replacing those (total) 8 minute mid-route diversions with a different 8 minute diversion in alternate services. D3A via Whitley and Batheaston, D3B via Corsham. As ever with what [is / should be] a network, lots of ripples to consider. 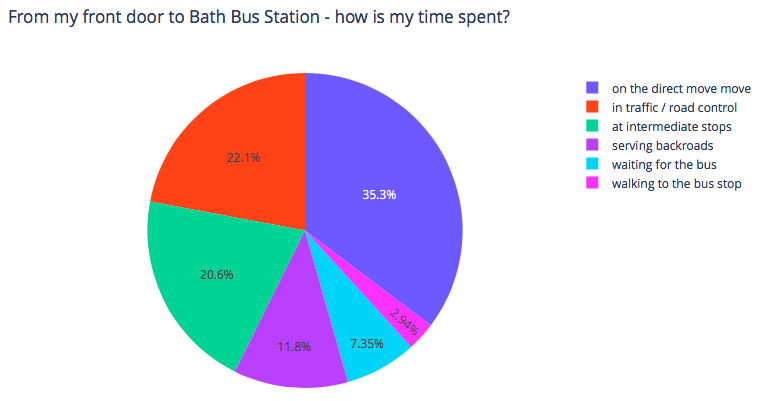 As for improving bus journey times, I don't know Bath well at all, but if it's anything like Cardiff, the key issues will be bottlenecks on the outskirts of the city centre. For instance, Cardiff Council could improve bus journey times no end by banning cars from all of the bridges over the Taff except the A4232 and the M4 (and any council that tried this would immediately lose the next election). The other thing that makes buses really unattractive is the way that so many British cities have radial routes that get into the centre and terminate, rather than continuing out the other side. This gets particularly ridiculous when one throws in pedestrian zones, so that buses will tend to terminate from both sides on the near side of the centre (forcing a long walk to interchange) or on silly one-way loops with a massive layover half-way round (a recipe for circuitous and slow journeys – I don't know why bus companies don't understand the basic point that most passengers do not want to travel in circles). You're on the move for 61 out of 97 minutes ... that's assuming that "walking" is all movement and not too much waiting for pedestrian crossings or chatting with folks you bump into. I suspect they're damned if they do and damned if they don't. Sorry you don't know Bath but it's my local example. Some of the routes are joined, others not ... but then which route do you link to which other route? And how do you keep delays on one side of the city being reflected into delays on the other side? Where you get a city centre one ways system (often cursed by the bus operators as much as by the users!) and cross-city buses are both on the same city loop, how do you ensure that people - especially visitors - catch the right direction? The weird thing is that the 210 makes the mirror image to the 46's hairpin turn a little further north in Hampstead. It's as if someone's perversely mismatched the route segments. I observed during the journey at the top of this thread - Melksham to path last night; I had a 6 p.m. appointment actually at the bus station. Left home 96 minutes before 6 p.m; the following bus actually scheduled to arrive at 18:00 was too risky. Contraflow service, so few passengers to slow it at stops. But noticeable how one or two individual passengers joining / leaving took significantly longer than the average passenger. Homeward journey - finished at 19:42, bus at 20:00 - only as far as Market Place then walked via Chinese takeaway; was checking email rather than observing on the bus; getting used to typing on the bus without feeling sick!.